This blog post is sponsored by Pfizer Consumer Healthcare. Is it really almost time to go back to school? For us, summer started late and ends early; the school district here is resetting the school calendar (ugh!). This was my first year as a teacher and I have to say, summer has been good to me. I know why teachers need two months off! This upcoming school year will be full of new adventures for both Aidan and me. My baby boy is going into kindergarten. I’m not sure who I am more nervous for, me or him! I am not sure what challenges and triumphs the next school year holds. 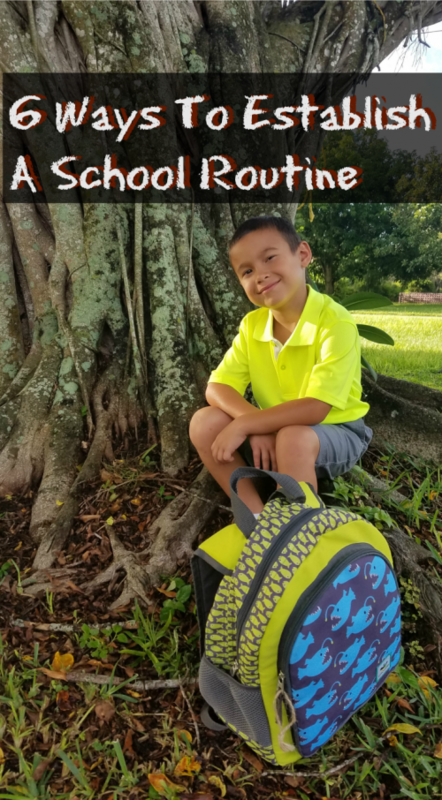 What I do know is that I need to set a back-to-school routine and start it now! Take a look at the upcoming school year bell schedule and compare it to your work schedule. Not only will you be getting ready, but you’ll be getting your kids ready too. Take into account the whining, dragging of feet, and spilling of milk, and give yourself plenty of time to sit in traffic, too. Once you set your wake up time, ease your kiddos into bedtime slowly over the course of the 2 weeks leading up to the big day. This is one thing you do not want to put off until the night before! Don’t set yourself up to scramble in the morning. Take time out of your Sunday to set clothes aside for the entire week. Designate a drawer and separate the space with organizing slats for each day. Have socks, underwear, pants, shirts, and even hair bows ready in advance. If you don’t already have one, this spot should hold backpacks, school books, laptops/tablets, and whatever else your child’s school requires them to bring. If your child’s school is like mine, they provide them with technology that must be charged each night, so it’s an added bonus if your designated spot has a technology charging station. Set boundaries for TV, computer, and tablet time. This tip is especially helpful when it comes to bedtime. Let the brain sleep, and turn them off a couple of hours before bedtime. If your kids are like mine, they graze like cows all summer long. School will be a different story. To ease the transition, find out when lunch time is and ease your child into that routine. Get them eating and finishing their meals within that time frame. As a mother, it is important for me to set a routine that we can all stick to. I think one of the major things to consider when going back to school are the germs. As a teacher, I was sick a minimum of once a month last school year. I couldn’t imagine how bad it could have been if my sleep schedule wasn’t on point. That is why it is important for me, as a mother, to set a back-to-school schedule that includes lots of great sleep for all of us. I can’t handle what might happen if our immune systems aren’t ready to handle the germs! In the chance that you or your little one does get sick, check out the Sick just got real. ™ Facebook Page. It is packed with great tips and tricks on being prepared for those Sick just got real.TM moments for you and your family!